The 1987 Tour de France winner does not want the Lance Armstrong controversy to further tarnish the reputation of the sport. 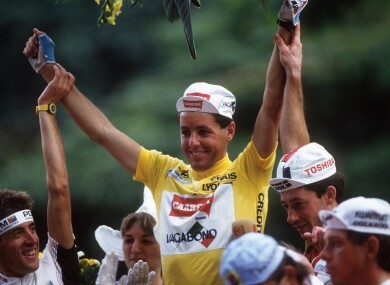 Roche celebrates his Tour de France win in 1987. FORMER TOUR DE FRANCE winner Stephen Roche believes that cycling’s doping problems are a thing of the past, despite the revelations surrounding American cyclist Lance Armstrong in recent months. Armstrong and his associates in the United States Postal Service team stand accused of creating the “most sophisticated, professionalised and successful doping programme that sport has ever seen” by the US Anti-doping Agency. Roche, who won the biggest event on the cycling calendar in 1987, feels that the sport is the cleanest it has ever been and is dismayed that recent events have dragged its name through the mud. “Cycling has come along a lot since 1999. Maybe it got worse before getting better in the early 2000s, but definitely in 2010, 2011, 2012, even though (Alberto) Contador had his problems, cycling has come on an awful lot,” insisted Roche. “Whatever mischief was going on then could never happen today. Team Sky have recently stated their intention to sever ties with any rider that has ever doped. Roche is good friends with Sean Yates, Team Sky’s sports director and a man who used to have strong links to Armstrong. The Irishman feels it would be wrong to reprimand Yates purely on the basis of his association with the disgraced Texan. Roche added: “Is everybody guilty through association? In that case, get rid of everybody. Wipe out half the peloton, half the directeur sportifs, half the managers, half the UCI and then start from scratch. “I’d understand, but I don’t think it’s really fair. It’s a bit radical to tear things up like that. “Sean has been a great part of Sky. He’s been a great asset to cycling. I think it’s unfortunate if he loses his job now because of this. Email “Stephen Roche: Cycling is cleaner now than it ever has been”. Feedback on “Stephen Roche: Cycling is cleaner now than it ever has been”.